Improve your overall health with vascular surgery at our specialized vein center at Southcoast Health. Spider veins, varicose veins and other venous diseases may be painful and embarrassing. At Southcoast Vein Center, our skilled vascular specialists offer compassionate care for the treatment and management of venous diseases and varicose veins in Dartmouth, MA and Middletown, RI. When you visit our vein center, you’ll experience comprehensive care in a warm, spa-like atmosphere, with vascular specialists focused on you. Our services include vein sclerotherapy, vein removal (phlebectomy), radiofrequency ablation (RFA), endovenous laser treatment (EVLT), and the newest cutting edge procedure, VenaSeal™. VenaSeal uses no thermal energy, no tumescent anesthesia and does not require you to wear compression stockings after the procedure. 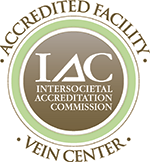 All of our procedures are performed by board-certified vascular and endovascular surgeons. To learn more about our vein center in RI or MA, call (508) 973-2213 and make an appointment with a vascular surgeon at Southcoast Health. Sclerotherapy treats spider veins and small varicose veins in your legs. Your surgeon injects a special solution directly into your vein. This solution irritates the lining of your vein, causing it to swell and collapse, which blocks the flow of blood. The vein will eventually become scar tissue and disappear. Your body will redirect blood flow to other veins. Southcoast uses the most advanced techniques in sclerotherapy using Aesclera (shown to be more effective than traditional saline). In addition, we perform foam sclerotherapy, ultrasound guided sclerotherapy and post procedure thrombectomy to reduce staining. Southcoast is one of the first to offer both nonthermal as well as thermal ablation techniques in the area. Non-thermal non-tumescent venous ablation using VenaSeal closes diseased veins using cyanoacrylate adhesive. This new FDA approved product has been being used for decades but now is available to help our venous patients. Venaseal has been shown to result in less bruising and a faster return to daily activities. We also offer more traditional thermal vein ablation. This is an advanced technique that uses energy to close and eliminate varicose veins. Southcoast Health offers both radiofrequency ablation (RFA) and endovenous laser treatment (EVLT) as minimally invasive procedures. Vein removal, also called phlebectomy, is performed in the office under local anesthesia. This can be done in select patients with branch varicose veins and eliminates the need to go to the hospital. Dr. Gillespie leads our vascular and endovascular surgery program, using the latest surgery techniques for positive patient outcomes. Dr. Pin specializes in treating an array of venous conditions, performing minimally invasive procedures to reduce complications and quicken recovery times. When you visit our Southcoast Health Vein Center in MA or our satellite vein clinic in RI, you’ll receive care from a team of vascular surgeons devoted to your comfort and well-being. Our vein treatments are safe and less invasive than traditional surgery, leaving virtually no scars and resulting in quicker recovery times. Southcoast Health offers noninvasive spider and varicose vein treatment at our vein centers in Dartmouth, MA and Middletown, RI.